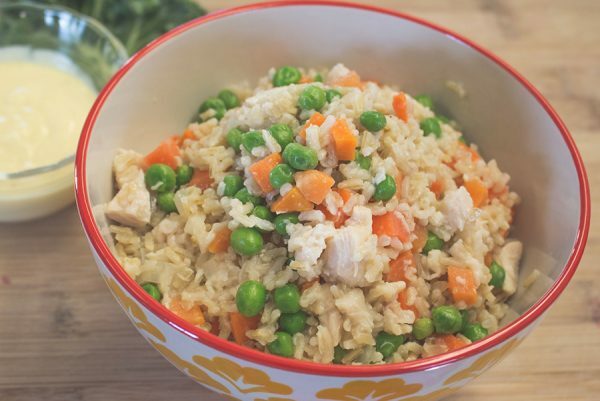 This fried rice is faster and healthier than any you could get at a drive-thru. Put oil in large (10″) skillet. Turn on medium-high heat. When the oil is hot, add chopped onion and 1 Tablespoon of the chicken broth. Cook and stir over medium-high heat until onions start to soften, about 2 minutes. Add rest of chicken broth to skillet. Cover and bring mixture to a boil. Add instant brown rice and stir. Reduce heat to low. Cover and simmer 5 minutes. Turn off heat and let stand, covered, 5 minutes, until water is absorbed. While rice is cooking, mix together plain nonfat yogurt, light Ranch dressing, sugar, mustard, and ketchup for Yellow Sauce in small (1 quart) bowl. When rice is ready, remove cover and fluff with a fork. Turn heat on medium. Add frozen vegetables and canned chicken. Cover and cook 3-4 minutes, stirring occasionally, until vegetables are hot. Serve with Yellow Sauce on the side. Add chicken broth, instant rice, onion, and oil to 2-quart, microwave-safe bowl. Microwave for 5 minutes, then let stand for 5 minutes. Add frozen vegetables and canned chicken. Microwave 5 minutes, stirring occasionally, until vegetables are hot.